April 20, 2017 – Six Flags Great Adventure announced that Zumanjaro, the world’s tallest and fastest drop tower, will become Drop of Doom VR for a limited time. Beginning May 5th, thrill seekers will have the option of battling giant spiders high above massive city skyscrapers in a fully-integrated virtual reality experience on the 415 foot (126m) tall free fall attraction. Park guests will become pilots of a futuristic gunship under attack by mutant spiders during the intense, interactive ride that features a high speed vertical ascent up 41 actual stories that transforms into 100 virtual stories while teetering off the edge of a helicopter. On the way up they will have a high-intensity gun battle against a giant arachnid, spewing baby spiders that virtually crawl all over the rider’s body. The thrilling 10-second fiery plunge straight down at speeds up to 90 mph (145 km/h) between towering skyscrapers concludes in a final showdown with a spider the size of a van, teeth-gnashing and in full attack mode. 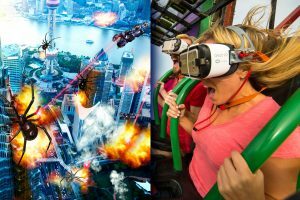 Read more about new virtual reality attractions coming to parks in 2017, including Drop of Doom VR, in our Forum Discussion. This entry was posted in News and tagged Drop of Doom, Great Adventure, Jackson, New Jersey, Six Flags, Virtual Reality, VR, Zumanjaro. Bookmark the permalink.